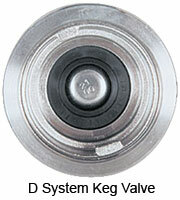 "D" system is the most common system available in the U.S., also known as American Sankey. It is used by all the major breweries—Anheuser—Busch, Miller, Molson—Coors, and Labatt as well as most craft breweries. The keg coupler connects to the keg valve, "tapping" the keg. Both the gas line from the CO2 tank/regulator and the beer hose to the beer faucet attach to the coupler.